The novel begins as Goldman re-imagines himself and introduces himself as the narrator. William Goldman the narrator is a little boy who isn’t into sports and is somewhat of an introvert up until he develops pneumonia. During his illness his father reads to him “The Princess Bride” by S. Morgenstern and from then on his love for books starts. That being said, William never read the book himself. As he grows up we learn that William is now married to Helen a psychiatrist and has a little boy. 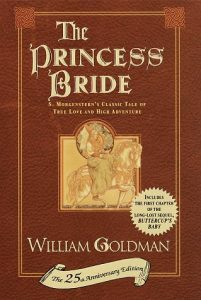 When William’s son Jason turns ten, his father becomes adamant to gift him a copy of “The Princess Bride”. After he finally finds a copy, he gives it to his son and later asks him about the book. Jason claims he enjoyed reading the book, but when William begins to ask him specific questions about the book, he is unable to answer. William is upset to find that his son did not read the book and his wife exclaims that it was too difficult for the child to read. When William locks himself in the library to read the book, he is surprised to discover that his father only read the good parts of the story and that the story is the author’s boring satire of his home country. Upon his realization, he decides to write an abridged version of the author’s work with only the good parts that contain all the ideals of true love that he used to believe in in the past. He begins to tell his tale from then on. It seems the narrator’s life is miserable and his abridgement is a spark of hope that he gives to his readers to encourage their imagination. The tale begins as the readers are introduced to the character of Buttercup, a wild child who enjoys the wilderness and riding horses and pays no attention to her appearance, all of which are characteristics that are far from the stereotypical ideal princess. Aside from horse riding, she also enjoys making fun of the Farm Boy and ordering him around. The Farm Boy always responds to her orders with “ As you wish”. The readers only learn how truly beautiful Buttercup is when she confronts the one of the other village girls as to why they don’t like her. The girl confesses that it is due to Buttercup’s beauty that has boys falling for her. Buttercup is a contrast to other girls who are consumed with appearances, she simply does not care what she looks like. One day, a man sees Buttercup and sends word to Count Rugen of the beautiful sight he saw and him and his wife come to see her. Meanwhile, that same night Buttercup can’t help but think of the Farm Boy and realizes she is in love with him. When Buttercup shares her feelings with the farm boy he rejects her, however he then returns to her and confesses that every time he said “ As you wish” he really meant “ I love you”. He then sets off to find fortune in America. A misfortune occurs while Westley is at sea as his ship is attacked by the notorious Dread Pirate Roberts who never leaves his victims alive. Buttercup is heartbroken when she receives the news and vows to never love again as she locks herself in her room. When Buttercup emerges from her room, she does so as a woman and not a wild little girl. The story then shifts to Prince Humperdinck, a not so good looking prince whose only passion in life is hunting as it shows off his skills to the world. His love for hunting so great that he builds the “Zoo of Death” tended by an albino zoo keeper with five floors packed with all kinds of beasts, all except for the fifth floor which is yet to be filled with a worthy opponent. One day, Humperdinck receives the news that his father King Lotharon is dying and that he must find a bride to make queen and produce an heir. To his dismay he sets out to find the most perfect trophy bride to show off to the world in all vanity. The King and Queen agree to consider Princess Noreena from Guilder, but Humperdinck is horrified to discover her baldness when a draft blows off her hat. Humperdinck being superficial, hears of Buttercups beauty and proposes to her. Buttercup confesses her love for Westley and her inability to love again, but the prince confesses that he does not want love. In essence, the prince the exact opposite to Westley who is indifferent to appearances and loves buttercup for who she really is, instead Humperdinck is vain and only wants a bride as a mere trophy to showcase. Prince Humperdinck announces his engagement to Buttercup to the people of Florin, meanwhile three villains are starting to etch closer with a plan to kill buttercup. The reader is also made aware of the Man in Black lurking in the background. After the announcement, Buttercup takes her horse for a ride and is kidnapped by three villains; the Sicilian, the Spaniard and the giant Turk. Buttercup awakens to find herself in a boat and listens to the three men talk of their plans to kill her. In fear, Buttercup jumps into the water and one of the villains warn her that the sharks in the water will devour her. Buttercup is discovered and recaptured due to her hiding place being revealed by the moonlight. The kidnappers reach the Cliffs of Insanity aware that there is a black ship with a Man in Black following them. As they rope climb the cliffs they realize that the man is also climbing after them and so they cut the rope off to stop him from catching up to them. The Man in Black holds on to the rocks and finally makes his way almost to the top. The rest of the villains leave with Buttercup and instruct Inigo the Spaniard to kill the man. Inigo however is impressed by the man’s skills and awaits for him to reach the top while practicing with his six fingered sword. Inigo laments on his past when he looks at the sword. His father Domingo made the sword specifically for a six fingered man, but the man was not pleased with it and resolved to pay Domingo very little. Domingo refuses to give the man the masterpiece that is the sword and in return, the man kills him and leaves two scars on ten year old Inigo’s face. Inigo spent his entire life training to avenge his father’s murderer and is saved from his hopeless drunken pit by the Sicilian who offers him a job. Inigo helps The Man in Black up the cliffs as he sees him as a worthy opponent. When he reaches the top they start to duel until Inigo forfeits. Rather than kill him, they share a kind of mutual respect and so the man only leaves Inigo unconscious and ties him up. He goes on to follow Buttercup, Fezzik the Turk and Vizzini the Sicilian. The villains realize that the Man in Black is still following them and so Vizzini the Sicilian orders Fezzik to wait for the man and fight him. Fezzik is saddened by the thought of Inigo’s death and he thinks of his own past. Fezzik comes from a humble background like Inigo and grows up as a sensitive character who loves rhyming joins the circus only to be fired and left alone for Vizzini to find. When Fezzik fights the man in black he is left unconscious. The man then goes after the Vizzini who awaits arrogantly and has set up a picnic as they engage in a battle of wits. The Man in black poisons a glass of wine and challenges Vizzini to drink and see who has the poisoned glass. Vizzini dies and the man confesses to Buttercup that he is immune to the poison and that both glasses were poisoned. As they continue along their journey, The Man in Black taunts Buttercup for her love for the prince, and in annoyance she confesses to have only loved once and will never love again. She then tells him to die and pushes him off the cliff when he is distracted by the prince’s armada approaching. He replies with a barely audible “ As you wish”. She realizes that he is Westley and jumps after the love of her life as they share an intimate kiss and try to make their way out of Humperdinck’s Fire Swamp which is infested with enormous rats, snakes and snow sand. Westley also confesses that he survived by telling the Dread Pirate Roberts of his love for buttercup and so Roberts taught him all his skills including fencing and fighting and finally revealed to him that he isn’t the real pirate and that the real Dread Pirate Roberts has been retired for years with many successors. When they reach the end they find Humperdinck waiting on the other side and Buttercup bargains for Westley’s life as the prince agrees to let him live. He later places him on the fifth floor of the Zoo of Death and uses Count Rugen’s ridiculous life sucking machine to torture him. Meanwhile Goldman interrupts to show the unjust situations that all the characters are in and warns of more injustice to come. Inigo and Fezzik are lost and are desperately trying to find each other. Buttercup is racked with guilt for leaving Westley and her guilt is manifested in her nightmares. The next morning Buttercup tells Humperdinck that she will kill herself if she marries him because she only loves Westley. He promises to send out four ships with a love letter addressed to Westley and if he comes back for her then she is free to marry him. But he later admits to her that he did not send any ships at all and laments that it was his plan to kill her all along and hire the kidnappers. Humperdinck locks her in her room and plans to kill her after their wedding and frame the Guilderians. Humperdinck is left angry and puts the torture machine into full blast killing Westley and sending a scream echoing. Meanwhile Fezzik and Inigo are reunited and Fezzik tells Inigo that the six-fingered man is in the castle of Florin. The duo hear the sound of Westley’s scream and storm the Zoo of Death only to find him dead. They take him to Miracle Max, a previous employee of Humperdinck’s. He gives him a miracle pill to restore his brain function for a while and the trio storm the castle on Buttercup’s wedding day. Buttercup has hope that Westley will rescue her and Humperdinck rushes the wedding. Their marriage is final and Buttercup leaves to her honeymoon suite to commit suicide. Meanwhile the trio make their way into the castle and Inigo recognizes Count Rugen and his six fingers and finally has his revenge by stabbing him to death with the six-fingered sword. They notice Westley is gone as he catches Buttercup before she kills herself with a dagger. Just as they share their moment of reunion the prince interrupts. Westley challenges him to a duel saying that if he wins he will mutilate him. Being the coward that he is, Humperdinck forfeits and buttercup ties him up. The couple are joined by Inigo and they look out from the window to see Fezzik with the prince’s horses. The couple profess their undying and unwavering love for each other and four of them ride off on the king’s fast white horses as they are chased by the king’s loyal subjects. Goldman says that his father would end the story here but S. Morgenstern’s version is dark and in it the four meet their demise. Goldman invites the readers to make their own ending but says he believes the four do make it out alive but that they do not go on to live perfect lives and that all characters experience minor downfalls because life is never perfect nor fair.